Samsung has announced two new soundbars, the HW-Q70R and HW-Q60R, as part of a collaboration between Samsung Audio Lab and Harman Kardon. 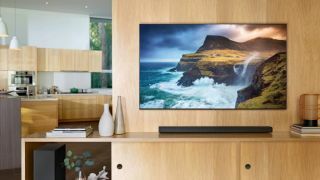 Samsung says that both soundbars use the company's Adaptive Sound technology to "analyze the content playing on a viewer's TV and adjust in real time to the ideal sound setting for any given scene". Jongsuk Chu, Executive Vice President of Visual Display Business at Samsung explain that, thanks to the artificial intelligence technology of Adaptive Sound, "listeners can enjoy an even more realistic sound for every genre of content". Both the HW-Q70R and the HW-Q60R utilized Samsung's proprietary Acoustic Beam technology, which is designed to fire sound through an "array of fine holes to create a panoramic soundscape". In other words, these soundbars should be able to fill your living room with sound for an immersive viewing experience. You can also connect to both soundbars via Bluetooth, which means you can use them to play music via your smartphone without any annoying cables. If you're looking for Dolby Atmos support as well, you'll want to opt for the HW-Q70R, which features the object-based surround technology, as well as DTS:X, like the Samsung HW-N950 – one of the best soundbars we've reviewed. The HW-Q70R has been designed with Samsung's Q70R QLED TV in mind, with a height of just 2.3 inches. Right now, just the HW-Q60R is available to buy in the UK for £599.99, while the HW-Q70R will be available to buy in April for £799.99. Samsung says both soundbars will be available to buy in April in other regions, but hasn't confirmed pricing yet – based on the UK price, you're probably looking at $790 / AU$1100 for the HW-Q60R and $1000 / AU$1500 for the HW-Q70R.